Turkish inflation surged nearly 25 percent in September from a year earlier, official data showed on Wednesday, hitting its highest in a decade and a half and underscoring the deepening impact of a currency crisis on the wider economy and consumers. Turkey's lira has fallen some 40 percent this year, hit by concerns about President Tayyip Erdogan's control over monetary policy and a diplomatic rift with the United States. That sell-off has pushed up prices of everything from food to fuel and eroded investor confidence in what was once seen as a high-flying emerging market. The lira weakened immediately after the release of the data, which was far higher than forecast. The currency was at 6.0633 to the dollar at 0717 GMT. 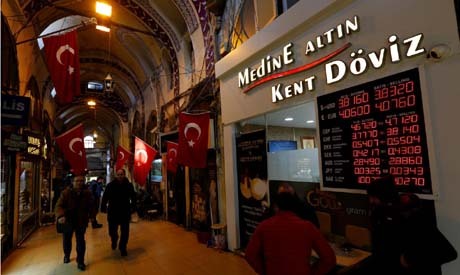 Inflation rose 24.52 percent in September from a year earlier, the data from the Turkish Statistical Institute showed. It rose 6.3 percent from the previous month, far higher than the 3.6 percent average increase in a Reuters poll of 15 economists. After inflation rose 17.9 percent year-on-year in August, the Turkish Central Bank signalled that it would take action against "significant risks" to price stability. It subsequently raised its benchmark rate by a hefty 625 basis points on Sept. 13, the biggest such increase in President Tayyip Erdogan's 15-year rule, providing some support to the ailing lira.